In 1831, Michael Faraday, an English physicist gave one of most basic law of electromagnetism called Faraday's law of electromagnetic induction . This law explains the working principle of most of electrical motors , generators, electrical transformer s and inductors. This law shows the relationship between electric circuit and magnetic field. 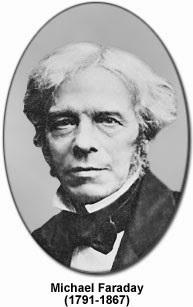 Faraday performs an experiment with a magnet and coil. During this experiment he found how emf is induced in the coil when flux linked with it changes. He has also done experiments in electrochemistry and electrolysis . experiment Faraday takes a magnet and a coil and connects a galvanometer across the coil. At starting the magnet is at rest so there is no deflection in the galvanometer i.e needle of galvanometer is at centre or zero position. When the magnet is moved toward the coil, the needle of galvanometer deflects in one direction. When the magnet is held stationary at that position, the needle of galvanometer returns back to zero position. Now when the magnet is moved away from the coil , there is some deflection in the needle but in opposite direction and again when the magnet become stationary at that point with respect to coil , the needle of galvanometer return back to zero position. 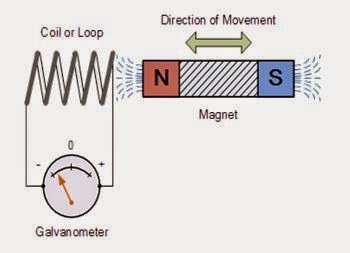 Similarly if magnet is held stationary and the coil is moved away and towards the magnet, the galvanometer shows deflection in similar manner. It is also seen that the faster the change in the magnetic field, the greater will be the induced emf or voltage in the coil.